Another view of the '5 mile bridge' to Slidell which includes a map of the route. This postcard was published by Alphonse Goldsmith, New Orleans, LA. In 1956, The Causeway captured the title. 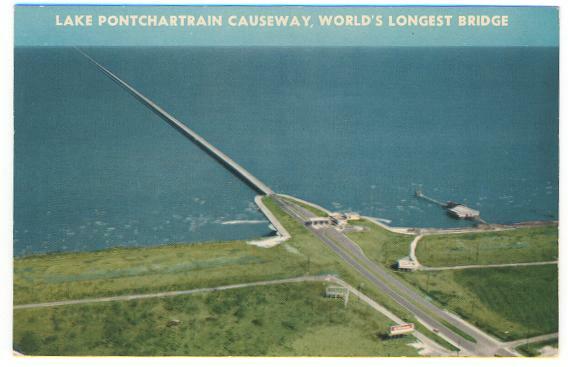 When the second span of the Causeway was completed in the late 60's it became the 'World's Longest Bridge'. 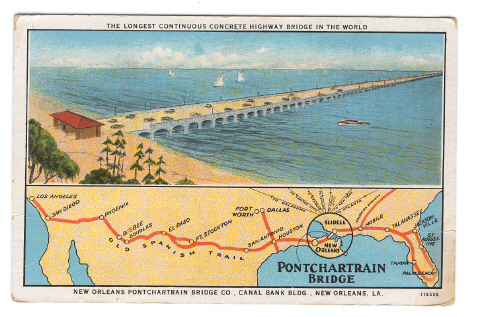 This postcard reads (on back) Lake Pontchartrain Causeway, World's Longest Bridge. Connecting New Orleans with the highlands to the north. It was completed in 1956. The Greater New Orleans Expressway System. We're trying to figure out which side of the Lake this photo depicts and which camp in included in the picture.